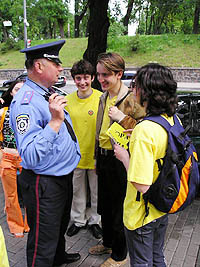 Kyiv, Ukraine  Today, on September 30, 2004 civic campaign PORA is holding a unique nation-wide action ­ simultaneous picketing of all territorial (regional) electoral commissions throughout Ukraine. The action started in 24 regions and the Republic of Crimea at 11 a.m. (Kyiv time). The participants addressed the heads of territorial electoral commissions (TEC) and announced plans to hold rallies near each TEC to ensure fair election results in the 2004 presidential race. A representative of the PORA campaign stated, "Manifestations near the TECs will be organized on the 31st of October and we expect that they will be among the largest in the history of independent Ukraine". PORA activists appealed to the TECs to exercise their assigned task responsibly. PORA wished them all patience, trust and courage in their work and called on the TECs to be honest during tabulation of the votes. PORA underscored that TEC members could be subjected to various forms of pressure by the authorities to falsify balloting results including demands and threats against family members. from 7 to 8 years of imprisonment according to the Article 157 of Criminal Code of Ukraine as a punishment for creating obstacles to citizens' right to vote. from 5 to 8 years of imprisonment, followed by limitation to hold certain position as punishment for declaring falsified election results and for substitution of ballots according to Article 168 of Criminal Code of Ukraine. This action is a follow-up of the event on September 16, 2004 which was held near the Central Electoral Commission building. It was announced that on November 1, 2004 PORA will conduct a peaceful manifestation to protect the fair results of election on the square in front of the Central Electoral Commission building.